Unlike most other countries, the UK uses ring circuits. The ring circuit is designed to supply a large number of sockets and is usually protected by a circuit breaker rated at 32A. In comparison, most other countries use radial circuits with a limited number of sockets protected with lower rated breakers, usually 10 – 20A. 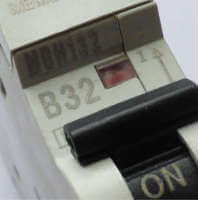 The 32A breaker in UK ring circuit may not provide adequate protection for the flexible cord fitted to an appliance, so additional protection is required by fitting a fuse in the plug. 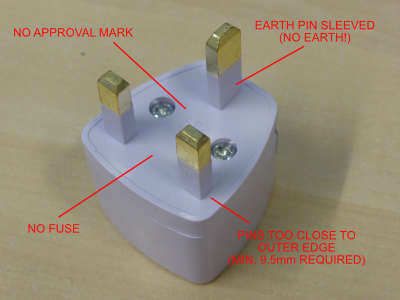 Because most non-UK plugs do not have a fuse, they must be used with a suitable fused adaptor for safe use in the UK. 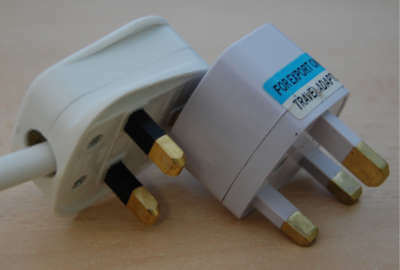 I would advise that adaptors being used on anything other than a temporary basis should be replaced by UK plug or conversion plug. 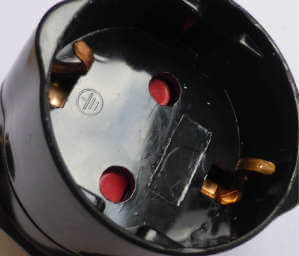 Non-compliant adaptors are often found during the PAT inspection. Fig 5. Shows an adaptor incorrectly using the CE mark. 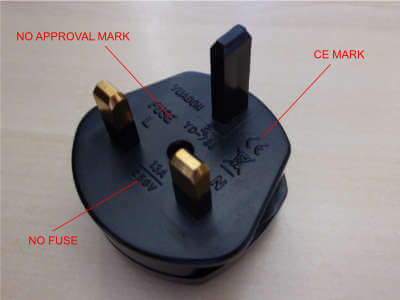 Plugs and adaptors should NOT be CE marked. "CE Marking is not to be used. Its use may constitute an offence under section 1 of the Trade Descriptions Act 1968." 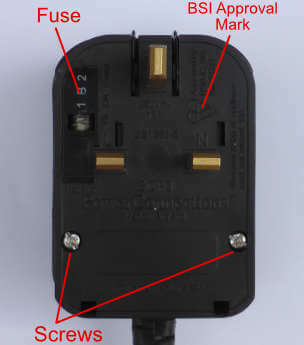 - Guidance notes on the UK Plugs & Sockets etc. (Safety) Regulations 1994. Fig.7 Earth pin can be plugged into the live terminal! Fig 7 & 8. 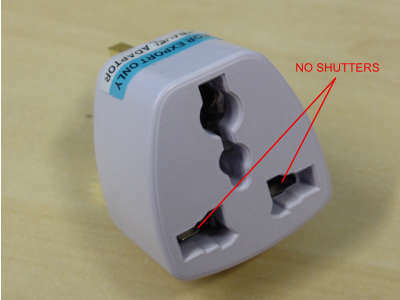 Demonstrate how a non-compliant plug adaptor will allow the earth pin of a BS1363 plug to be plugged into the live terminal. This is extremely dangerous, the metal case of a class 1 appliance in this situation would become live. 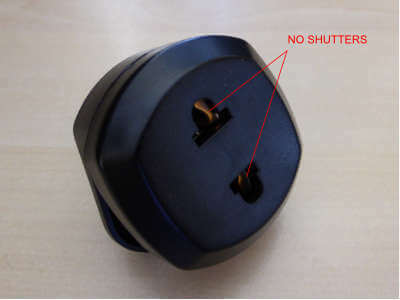 Online sellers often ignore the regulations and illegally supply equipment fitted with EU plugs. 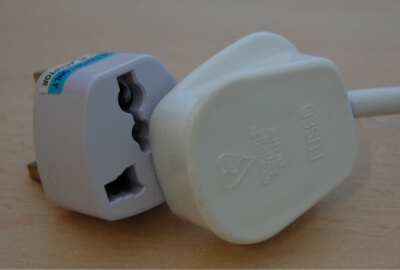 If an electrical appliance has an EU or other non-UK plug, it must be fitted with a conversion plug. 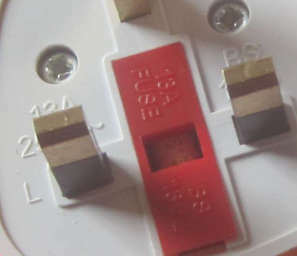 The conversion plug must enclose the non-UK plug and it must be designed so that it can only be removed by using a tool. 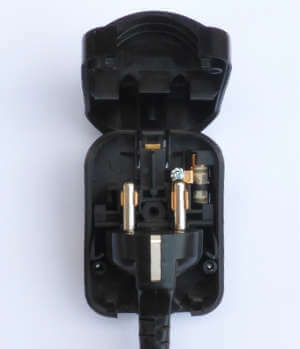 An adaptor is not a suitable replacement for a conversion plug. Fig.10 Must be fused, approved and screwed shut. The supply of electrical goods in the UK is covered by statutory legislation under the Plugs and Sockets etc. (Safety) Regulations 1994.